Reviewers:Malvika Mehra and Amit Akali, group creative directors, creative heads, Ogilvy and Mather, Bangalore. 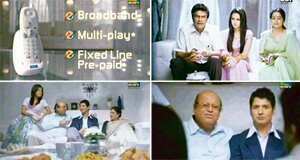 Spot: BSNL, Aap ke ghar ka number ad. The ad is set in a clichéd ladki dekhna (meeting the girl) ceremony with Preity Zinta as the bride-to-be. After asking numerous inane questions, her father asks for the guy’s number. The guy’s father starts reeling out his flat number and address. Zinta explains that they want their landline number so they can call them up. When the boy’s father says they don’t have one, Zinta refuses to marry the guy! No. 1: The plot, centred around a ladki dekhna ceremony, is the ultimate advertising cliché. No. 2: It’s also pretty corny. Zinta’s dad is asking for their phone number…they give their flat number. And on top of that Zinta refuses to marry him because he doesn’t have a landline! No. 3:The execution. Agreed that the script is weak, but the execution is even weaker. The characters and the acting are both over the top. Even the production is tacky. No. 4: Sometimes a star needs to be used according to her personality. Zinta as a demure girl being checked out in a ladki dekhna ceremony somehow seems an odd fit. Speaking of numbers, we’d like the numbers of the guys who wrote this ad. We’d like to call them up and ask them why they did it. Seriously, guys, did the client force you? Did servicing give you a sob story about how the agency needed the billings? What?!! How we would have done it: First, the brief (and that’s just our interpretation of it!) that a landline can be a status symbol seems off. In an era where mobile phones are the norm, a landline being a status symbol is not believable. Maybe there’s a story to be told in the offering itself. The fact that it comes with so much more like broadband, etc. If we took it on, we’re sure there are a number of interesting ways of selling the product. This is certainly not one of them.